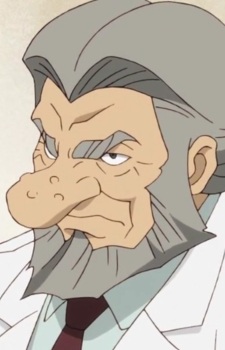 Like Dr. Ochanomizu, Saruta is visually identifiable by his large nose, though in his case it is grotesquely spotted. Where Ochanomizu generally appears in light and uplifting roles, Saruta is quite the opposite. His two main roles in Tezuka manga are both in extremely important series: Black Jack and Phoenix. In Phoenix, he is arguably an over-arching protagonist for the series as a whole, alongside its title character. He appears in every story, sometimes in a main role, sometimes in a peripheral one, sometimes with a new name and barely recognizable in his character, but always present and important. He is also distinguishable by the sheer amount of suffering he undergoes over the course of his many lives and deaths, as he demonstrates both the darker sides of human nature and the human capacity for perserverance and transcendence. In Black Jack, he is featured as Dr. Honma Jotaro, once a skilled and famous surgeon later thrown out of the medical community due to jealousy and doubt about his research, who saved young Black Jack as a child, was Black Jack's principle father figure during his life, and inspired him to become a doctor. Since Saruta is the character in Phoenix who best understands the system of reincarnation, life and death, it is appropriate that in Black Jack Dr. Honma is the figure who most frequently reminds Black Jack about the power of nature and the inevitability of death.